Danny Murillo from Norwalk, California, spent five of his 14 years behind bars in the infamous Security Housing Unit at Pelican Bay State Prison. At age 18, he entered prison after accepting a plea bargain to two counts of robbery. Once released, he went on to graduate with honors from UC Berkeley in 2015 and began a career as a distinguished legal researcher. How many more Danny Murillos are locked away in California’s prison system? Based on my experience as an adviser to the San Quentin News since 2012, I argue that there are many thousands more, and UC Berkeley and other universities need to take the initiative to support these men and women. And more students and faculty need to experience the face of mass incarceration in situ, rather than just in the safe space of the classroom setting for theoretical, academic discussions. San Quentin State Prison and the University of California are two of the oldest institutions in the state, both having been founded in the 1850s. The two institutions, however, have cooperated on few, if any, joint undertakings during the state’s plunge into a disastrous mass incarceration policy in the past three decades. 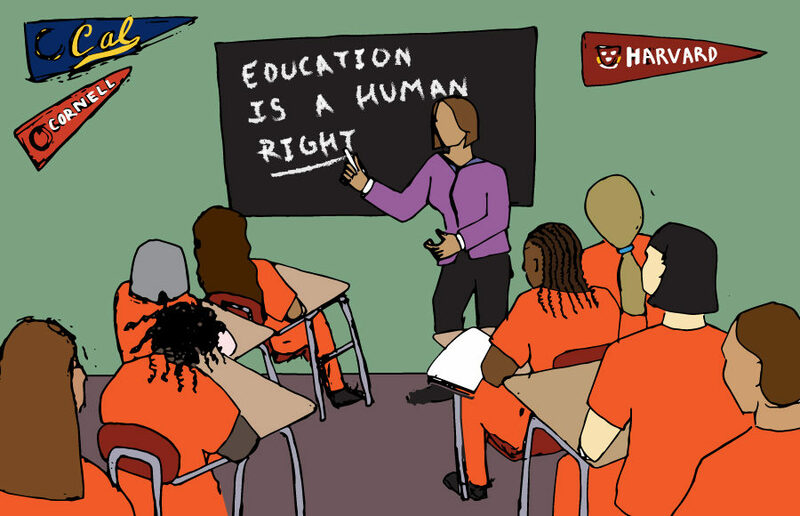 Incarceration funding represents a danger to higher education. The pipeline to prison requires more attention at UC Berkeley, especially among administrators, faculty and students. Rather than classroom discussions and scholarship, we need to offer students and faculty exposure to the reality of the prison yard, or throw a lifeline to inmates who are potential leaders yearning for the fruits of education, inaccessible to them in the prison yard. UC Berkeley has had a long and conflicted history with corrections. The UC Berkeley campus was for decades home to a distinguished school of criminology. Some of the most prominent names in the field of law enforcement served as the school’s dean, among them O.W. Wilson and Joseph Lohman, a former sheriff of Cook County, Illinois. Dean Lohman was especially effective in fundraising for the criminology school. During his tenure as dean from 1960 until his death in 1968, he raised more than $1 million. This was a stunning achievement for its time. But the money went to projects that angered many faculty, colleagues and students. “Under Lohman’s direction, the money flowed in, but there was little concern for the ethical or political implications of the funded research projects,” said an editorial in the journal Social Justice. The criminology school became so polarized that it was paralyzed. Matters came to a head in the 1970s when the UC administration disestablished the whole criminology school. Even though 50 years have passed, academic memories are long and durable. Meanwhile, in 2017, San Francisco State’s Project Rebound celebrated 50 years of success. Since its inception in 1967, Rebound has helped the formerly incarcerated through offers of special admission, counseling, tutoring, lunch vouchers and financial support. The Rebound concept has spread to seven other CSU campuses. The only thing comparable on the UC Berkeley campus is the Underground Scholars initiative. The goal of Underground Scholars is recruitment, retention, policy and advocacy. It lacks the institutional support and funding that San Francisco State gives to Project Rebound. The expansion of Project Rebound to other CSU campuses was financed through a $500,000 foundation grant. Though UC Berkeley’s effort is smaller, Danny Murillo and several others from the Underground Scholars experience have proved that dramatic results can come from even a modest investment in the formerly incarcerated. Berkeley students have created DeCal classes supporting teaching basic literacy to prisoners at San Quentin. Since 2012, I’ve also taught a school of journalism editing course in which UC Berkeley students visit the prison to help with research and with editing the award-winning San Quentin News. William Drummond is a professor of journalism at the UC Berkeley Graduate School of Journalism and has taught the Introduction to Journalism course at San Quentin State Prison through the Prison University Project.